Doors - The favourite method of entry for burglars, so a BS five-lever mortice lock or nightlatch is essential for all external doors. Further peace of mind can be gained from fitting security bolts, a chain and spy hole. Fitting hinge bolts helps prevent the door being ripped off it's hinges. 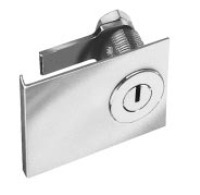 Windows - Fit locking devices, particularly to ground floor windows or those with balconies. Never leave a window open when you're out, even if this is for a short period of time. External Buildings - Heavy-duty padlocks should be used for sheds and garages. Don't forget that ladders and other tools could even help a burglar break into your house. Front of House - Keeping the front garden as open as possible will give the would-be thieves no place to hide and a gravel drive will be a further deterrent, as anyone approaching can be heard. Rear of House - All access points through gates should be made secure with a good quality padlock. Rear Garden - Hedges, trees and shrubs should be kept to a height that do not allow intruders to work away unseen. Fencing should not have any climbing aids on the outside and don't forget that prickly shrubs at the base will be an additional deterrent. Keys - Don't leave spare sets of house or car keys easily accessible. This will provide a burglar with an easy opportunity to re-visit your home. Alarms and Lights - Lighting that activates through heat sensitivity or movement will act as a deterrent and an intruder alrm will enhance home safety. Valuables - Mark items such as TVs and other high value possessions with an Ultra Violet pento aid identification. For irreplaceable items such as jewellery or antiques consider taking a photograph and note down an accurate description. Away from home - Make your home look occupied. Avoid the things that burglars look for - the milk left out, post left in the hall. Think about using time switches to switch on lights or a radio.